Phosphorylation site-specific antibody selective for the dually phosphorylated form of the c-Jun N-terminal Kinase (JNK)/Stress-Activated Protein Kinase (SAPK) enzymes containing a phosphate on threonine 183 and tyrosine 185 (human JNK 1 + 2). The antibody has been shown to recognize the endogenous, active forms of JNK 1 + 2 in a variety of cell types following treatment by a broad range of extracellular stimuli [e.g. including 293 cells (human embryonic kidney; +/- ultraviolet light) and PC12 cells (rat pheochromocytoma; +/- sorbital)]. The region of JNK1 and JNK2 surrounding T183 + Y185 has a high degree of similarity to the corresponding regions in JNK3 and thus may cross react with this protein if phosphorylated on the corresponding residues. Synthetic peptide (Human) derived from the region of JNK 1 + 2 that contains threonine 183 and tyrosine 185, based on the human sequence. This region is conserved among many species including human, rat, mouse, chick, nematode (Caenorhabditis elegans), and fly (Drosophila melanogaster). Purified from rabbit serum by sequential epitope specific chromatography. The antibody has been negatively preadsorbed using a non-phosphopeptide corresponding to the site of phosphorylation to remove antibody that is reactive with non-phosphorylated JNK enzymes. The final product is generated by affinity chromatography using a JNK-derived peptide that is phosphorylated at threonine 183 and tyrosine 185, within the activation loop. Note: It is the dually phosphorylated form of these enzymes that has full enzymatic activity. Our Abpromise guarantee covers the use of ab4821 in the following tested applications. ICC/IF 1/1 - 1/100. 1/100. WB 1/1000. Predicted molecular weight: 49, 55 kDa. Responds to activation by environmental stress and pro-inflammatory cytokines by phosphorylating a number of transcription factors, primarily components of AP-1 such as JUN, JDP2 and ATF2 and thus regulates AP-1 transcriptional activity. In T-cells, JNK1 and JNK2 are required for polarized differentiation of T-helper cells into Th1 cells (By similarity). Phosphorylates heat shock factor protein 4 (HSF4). Dually phosphorylated on Thr-183 and Tyr-185, which activates the enzyme. MEF1 cells were incubated at 37°C for 48h with vehicle control (0 µM) and 5 µM of glibenclamide (ab120267) in DMSO. Increased expression of of JNK1+JNK2 (phospho T183 + Y185) (ab4821) correlates with an increase in glibenclamide concentration, as described in literature. Whole cell lysates were prepared with RIPA buffer (containing protease inhibitors and sodium orthovanadate), 10µg of each were loaded on the gel and the WB was run under reducing conditions. After transfer the membrane was blocked for an hour using 3% milk before being incubated with ab4821 at 1/1000 dilution and ab85139 at 1 µg /ml overnight at 4°C. Antibody binding was detected using an anti-rabbit antibody conjugated to HRP (ab97051) at 1/10000 dilution and visualised using ECL development solution. ab4821 staining JNK1 + JNK2 (phospho T183 + Y185) in A549 cells (green, panel a) by ICC/IF (Immunocytochemistry/immunofluorescence). Cells were fixed with 4% paraformaldehyde, permeabilized with 0.25% Triton X-100 and blocked with 5% BSA for 1 hour at room temperature. Samples were incubated with primary antibody (2ug/ml in 1% BSA) for 3 hours at room temperature. 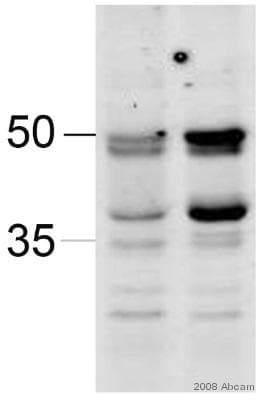 An Alexa Fluor® 488-conjugated Goat anti-rabbit IgG polyclonal was used as the secondary antibody (1/400). Nuclei stained with DAPI (blue, panel b), F-actin stained with Alexa Fluor® 594 Phalloidin (red, panel b) and merged images (panel d). To demonstrate the phosphorylation of JNK 1 & 2 in a cell based assay, 293 cells were treated with ultraviolet irradiation (UV). 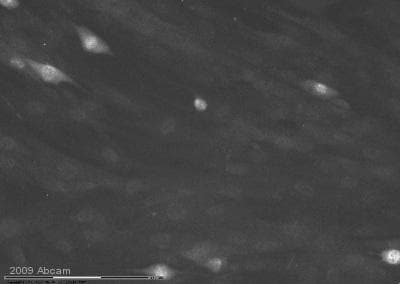 Proteins from cell extracts were resolved by SDS-PAGE on a 10% Tris-glycine gel and transferred to nitrocellulose. Membranes were incubated with either 1 µ g/mL ab4821 or 1 µg/mL anti-JNK1 pan. After washing, membranes were incubated with goat F(ab’)2 anti-rabbit IgG alkaline phosphatase and bands were detected using the Tropix WesternStar detection method. MCF7cells were incubated at 37°C for 4h with vehicle control (0 µM) and different concentrations of cryptotanshinone (ab120666). Increased expression of JNK1+JNK2 (phospho T183 + Y185) in MCF7 cells correlates with an increase in cryptotanshinone concentration, as described in literature. Whole cell lysates were prepared with RIPA buffer (containing protease inhibitors and sodium orthovanadate), 10µg of each were loaded on the gel and the WB was run under reducing conditions. After transfer the membrane was blocked for an hour using 5% BSA before being incubated with ab4821 at 1/1000 dilution and ab8227 at 1 µg/ml overnight at 4°C. Antibody binding was detected using an anti-rabbit antibody conjugated to HRP (ab97051) at 1/10000 dilution and visualised using ECL development solution. 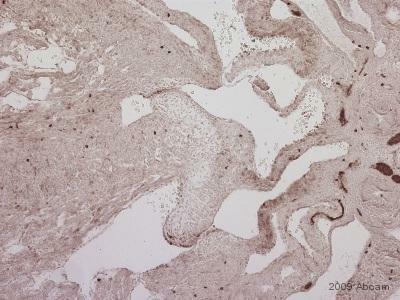 ab4821 staining JNK1+JNK2 (phospho T183 + Y185) in E12.5 mouse heart tissue section by Immunohistochemistry (Formalin/PFA-fixed paraffin-embedded sections). Tissue underwent cold 1% paraformaldehyde fixation before heat mediated antigen retrieval with Tris-EDTA pH9 and then blocking with 2.25% horse serum was performed for 20 minutes at RT. The primary antibody was diluted 1/400 and incubated with sample for 12 hours at 4°C. A Biotin conjugated horse polyclonal to rabbit IgG was used at dilution at 1/133 as secondary antibody. ab4821 staining JNK1+JNK2 (phospho T183 + Y185) in human foreskin fibroblasts by ICC/IF. The cells were fixed in cytoskeletal fixative, permeabilized in 0.5% Triton X-100 and blocked in 2% dillution buffer (2%BSA + 0.1% Triton X-100) for 1 hour at 25°C. The primary antibody was diluted, 1/100 and incubated with sample for 12 hours. An Alexa Fluor® 594 conjugated goat polyclonal to rabbit IgG, diluted 1/250 was used as secondary. Publishing research using ab4821? Please let us know so that we can cite the reference in this datasheet. 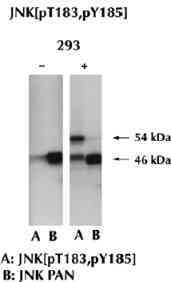 Hello, I have purchased this antibody (Ab4821) to quantify levels of phopsho-JNK 1/2 in human astrocyte lysates. I would like to standardize the phospho-JNK levels to total JNK (Ab112501). Would you suggest that I strip the membrane? If not, what other methods would be available? When making quantitative comparisons, such as standardizing the levels of phospho-JNK to total JNK, we do not recommend stripping and reprobing the membrane, as stripping removes some sample protein from the membrane. 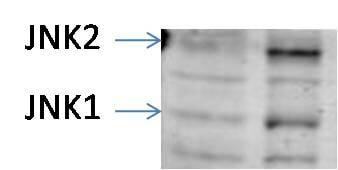 Instead, you should either run 2 separate blots or run 1 blot and cut it in half to stain with each antibody separately. I am planning to use this antibody (ab4821) in rat cell line. In the specificity section of the datasheet, it is written that it recognizes the active forms of JNK 1 + 2 in PC12 cells. Do you have any scientific reference for that ? To our knowledge, ab4821 has not been experimentally tested in rat. However by participating in our AbTrial program you can now use our products in an untested application or species without financial risk. I need to order a specific antibody against JNK1 and JNK2 which does not cross-react with JNK3. The antibody I want (ab37228) is out of stock until July which is too long to wait and so I was looking at buying ab4821. 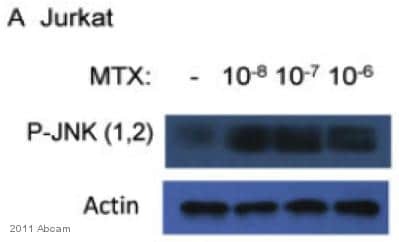 However, it doesn't state whether this is specific for JNK1 & JNK2 without detecting JNK3 and when I look at specific JNK1 antibody ab10664 it seems that the Western blot in the datasheet for this is identical to that for ab4821 but with different labelling for lane B (apparently specific JNK1 antibody in one but a pan JNK1/JNK2 in the other). Thank you for your enquiry. The epitopes for both ab4821 and ab10664 are conserved for JNK1, 2 and 3. These antibodies will most likely cross react with JNK3. I hope this information helps, please do not hesitate to contact us if you need any more advice or information.